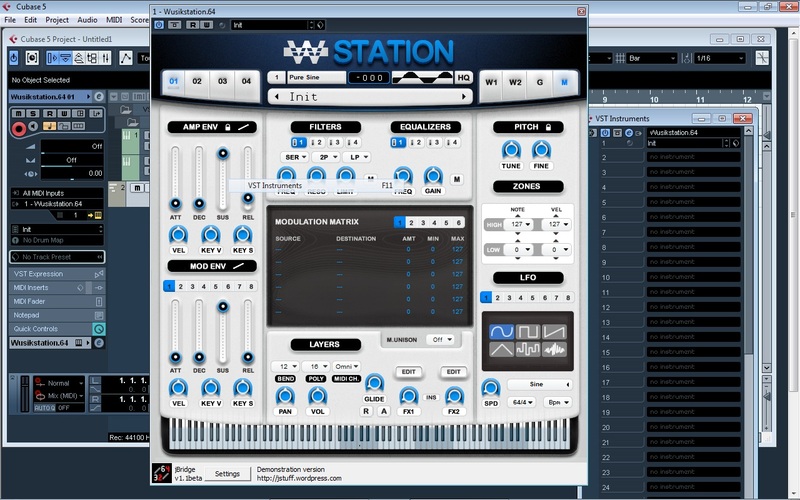 jBridge is an application designed for bridging VST plugins (up to the 2.4 VST specification). Using inter-process communication mechanisms, JBridge is designed to let you run 32bit plugins in 64bit hosts and 64bit plugins in 32bit hosts. It even allows you to bridge 32bit plugins to 32bit hosts, letting you overcome the memory limitations of a single 32bit process. Loading data should be a bit faster now. Added measures to prevent bridging files from being bridged (which could cause a big mess). Added compatibility measures for Adobe Audition. Added workaround to prevent a crash with some plugins in FL Studio. Bugfix for issue where, in some occasions, a "buffer already exists" message could be displayed. Bugfix for an issue where, in some systems, the "edit settings" button would do nothing. Bugfix for GUI glitches with some plugins/hosts. Bugfix for garbled sound problem with WaveLab and some plugins. Bugfix for crash with Metro in undo/redo operations. Bugfix for a problem where some plugins would be muted after resume. Bugfix for crash that could happen with Podium and some plugins. Bugfix for crash that could happen in Ableton Live when rendering to offline. Auxhosts should now quit after the main host on a forced shutdown. Compatibility/Performance enhancements for automation handling.